Various NGOs led by Garoland State Movement Committee (GSMC) protest before Additional Secretariat building in Shillong demanding a Garoland. 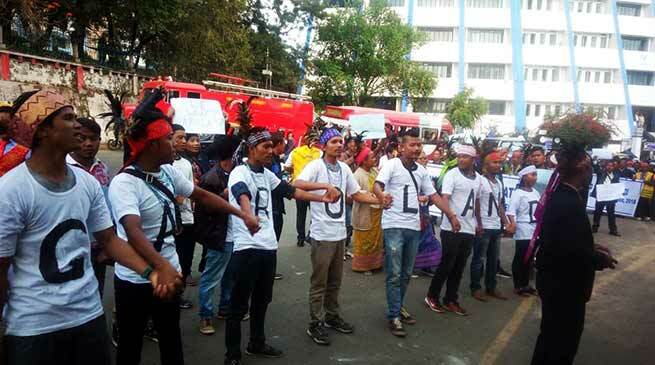 Garo Hills State Movement Committee with several other NGOs staged a massive protest here on Wednesday to press for carving out tribal Garo inhabited areas from Meghalaya and Assam as separate Garoland . The GHSMC, a conglomeration of several Garo organisations, including regional political party Garo National Council (GNC), emphasised that its demand was on the linguistic lines of the States Reorganisations Act, 1956. GHSMC chairman Nikman Marak told media, “The demand for a separate state is our birthright as well as legal right. It is high time that the government recognises Garoland officially. In the last elections, Meghalaya Chief Minister Conrad Sangma spoke about the issue in Parliament but no substantial step was taken by the Centre on the issue. We are still struggling. We will continue to protest till all our demands are met by the government. Garo National Liberation Army’s former chairman Champion Sangma also commented on the issue reiterating that the sub-tribes will continue with their protest till the government fulfilled its demand for a separate state. Meghalaya became an autonomous state in 1971 and a full-fledged state on January 21, 1972. The GNC, one of the oldest regional political parties, has been demanding the creation of Garoland for the past 20 years. However, it does not have any representatives in the 60-member Meghalaya Assembly. However, it has merely three members in the Garo Hills Autonomous District Council. On March 18, 2014, the Meghalaya Assembly had rejected a resolution for the creation of a separate Garoland state in Garo Hills in the western part of the state.